On 5th Avenue in New York City, two very different men are shopping for gifts for the women they love. Gary is buying his girlfriend Rachel a charm bracelet. Partly to thank her for paying for their holiday-of-a-lifetime to New York. But mainly because he’s left his shopping far too late. Whereas Ethan’s looking for something a little more special – an engagement ring for the first woman to have made him happy since he lost the love of his life. But when the two men’s shopping bags get confused, and Rachel somehow ends up with Ethan’s ring, the couples’ lives become intertwined. The story centres on two couples. Both couples are spending Christmas in New York. On Christmas Eve, Ethan and his eight year old daugter, Daisy are buying an engagement ring for his future wife, Vanessa at Tiffany's. At the same time Gary needs a last minute gift for his girlfriend Rachel and heads into Tiffany's as well and buys a charm bracelet. Both of the guys have an iconic blue box from Tiffanys amongst their shopping. When Gary gets knocked down by a yellow cab and Ethan and Daisy rushes to help him it's plain what is going to happen. Duing the chaos of the accident the bags get switched by accident. Imagine the horror when your girlfriend opens a box containing a fairly cheap bracelet instead of an engagement ring, and imagine your joy when you open the present from your usually tightwad boyfriend to find a whopper of a diamond. I'm always feeling slightly heartbroken when I finish one of Melissa Hills books. They are over quite too soon. Having owned and read a copy of A Christmas To Remember, I was eagerly looking forward to reading this novel. 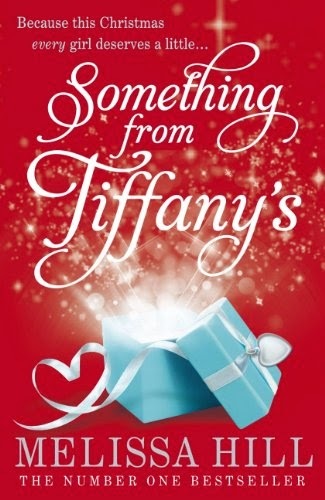 Somthing from Tiffany's is a wonderful chick-lit tale set around Christmas time in New York, London and Dublin. This book pulls you right in from the very first pages. It kept me on edge and I was so impatient to find out what's going to find next. At the beginning I thought it might be a predicatable read. I felt that way throughout most of the novel. At the end, it turned out to have a completely different ending than I have imagined. The twists are really cleverly done and kind of unexpected. It was like a puzzle: every little piece got its own place. I loved the characters, they were really real and authentic. I loved all of the different characters in it like Daisy, Ethan, Vanessa, Rachel and Teri. They each were so different and I could relate to every one. Gary was a brilliant written character but I hated him for being such a arrogant, narcissistic lying fool. I felt Rachel could do a lot better without him. Also I was frustrated with Ethan at times. He could bring himself to it get the ring back . Overall this book was amazing and I never knew what was going to happen which is why I could never put the book down. A well written story that you can read in a couple of sittings if you have a couple of hours. I can't wait to pick up another novel of Melissa Hills books.